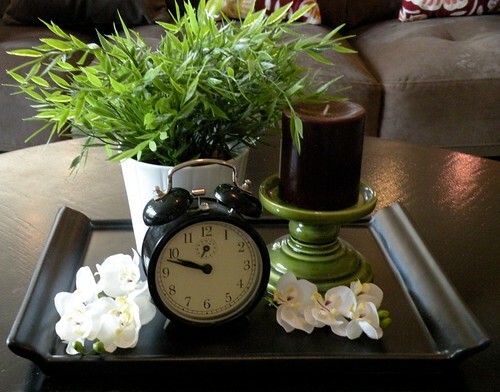 As much as I liked the centerpiece on my coffee table, it really needed a Fall makeover. My new centerpiece took me less than 10 minutes to put together and was free! 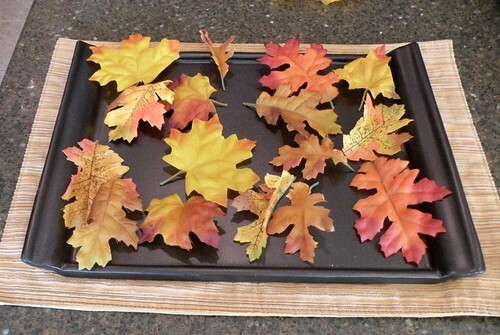 To create this super cute centerpiece, I took the tray from the last centerpiece, set it on top of a placemat I already had, and added some fake leaves. 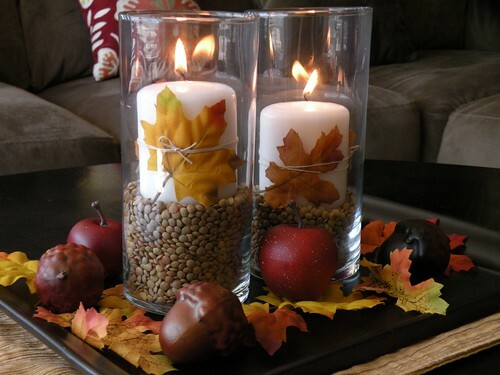 Then I added two dollar store glass vases and a few fake plastic acorns and apples from the Dollar Spot at Target. You can see that I was playing around with which size candle to use. I decided I wanted to have the little ones because I thought they were cuter, but they needed something under them to raise them up. I also wanted the candles to have something cute on them so I just took some hemp and leaves and tied them to the side of each candle. I love it. I can proceed now! Yay! A lot of my crafts are trial and error. I just play around with different elements until I get a look I like. Finally, I just added the glass jars back on the tray and I was done! One thing to point out if you make your own display is to make the levels of the lentils at different heights. It gives it more depth. I am very pleased with how this display turned out. And seriously, it was really easy to throw together! Now I’m just one step closer to having a Fall house! « So, I bought the filler stuff. Now what?! Your centerpiece looks great! Love the texture the lentils give the candles in the glass jars. Nicely done! 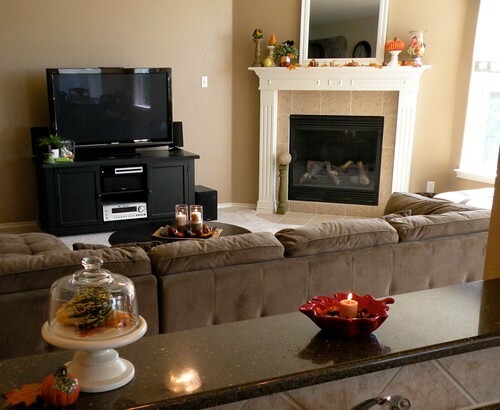 I’m loving all of your fall decor! Very nice. I’m so bummed, I can’t load any of your photos. Do I need to do something to fix it? They should be loading. I’ve checked 3 different browsers as well as the flickr account and they seem to be loading okay. Are you still having issues? very pretty! 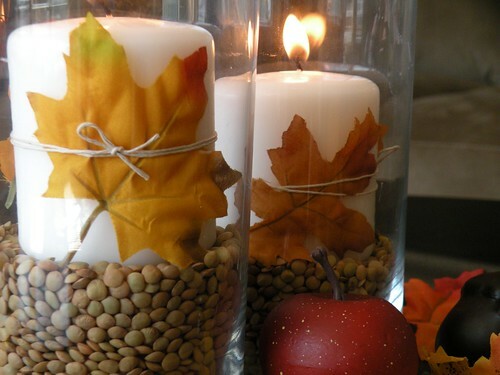 i love the idea for the candles! Oh my yes…have to do Halloween!!! 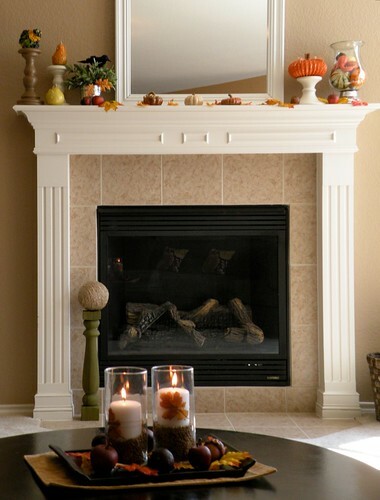 😉 😉 Your fall decor looks fabulous!! Love the candles! Love these!! I may have to steal your idea. Love all of these easy to do ideas. They look so lovely. 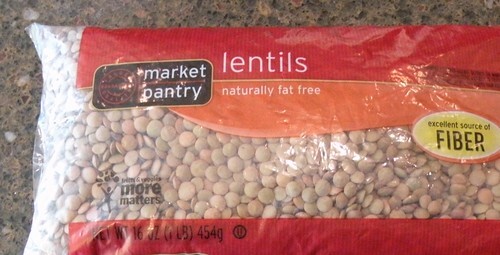 this looks awesome – would have never thought about using lentils. hmmmmm. i might have to do this in my dining room. I’m lovin the lentils. I never would have thought about that! Stop by and visit sometime over at Free 2 Be Frugal. 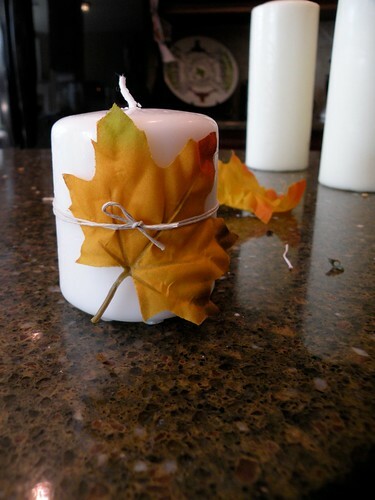 Congratulations, your pretty Fall Centerpiece made this week’s Top 5 Hits. Come check it out and grab a button if you’d like. Thanks for a great post! I love this beautiful display. The lentils give it an earthy touch that looks really great! Perfect for Fall. 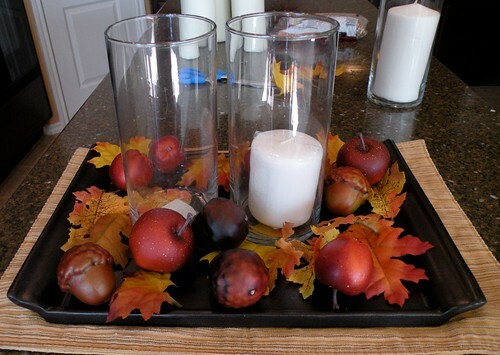 I love your centerpiece, all of of your fall projects! Beautiful centerpiece [the old one was too]. The lentils are a great idea, and I like how it’s ‘compact’, everything on a tray. Thanks for the inspiration, I’m going to try out something similar as soon as I find myself a nice tray for it. I love your centerpiece. 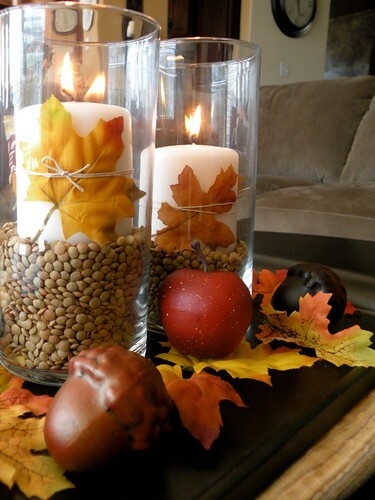 I was feeling stuck and needed some ideas on dressing up our living room for fall and decided to go with yours:) Coming through from Thrifty Decor Chick..
Those lentils are fascinating! Beautiful centerpiece! love it! you know i’ve been looking for a craft to do with coffee beans since i got several bags for free and since we don’t drink it i didn’t know what to do with them. i’m gonna try this, it looks great! 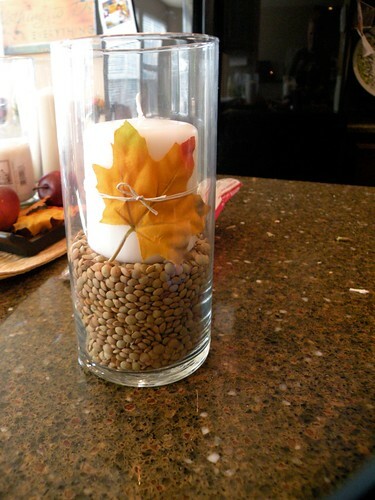 I never thought of using lentils as vase filler. Genius! So inexpensive and they look like cute little pebbles. This is so pretty. I would never have thought about the lentils and they are just perfect! I ♥ this centerpiece! 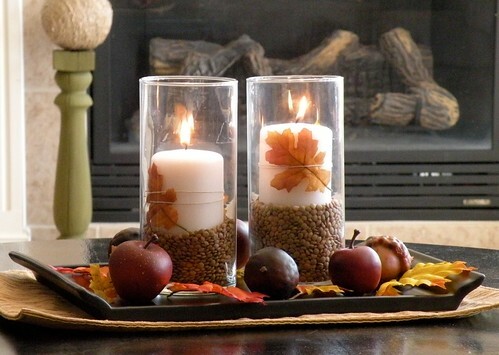 I found it via pinterest, and I think it’s awesome that you used lentils in the glass with the candles. What a great inexpensive idea! I featured it over on my blog today.